In the current world, the consumption of mobile devices and electronics has increased a lot. Imagining your day to day to life without a mobile is absolutely impossible. Any latest or older mobiles are lifeless without a charged battery, and to keep your mobile devices charged up even if there is no power outlet, you will need a power bank. The power banks come in a variety of shapes, designs and colours with different capacity of charging. You can find a wide range of power banks from different stores on DealsCorner. Compare the products and prices offered by various stores and choose the product of your interest in a reasonable price range from DealsCorner. With the increasing number of mobile devices, mobility of people has also increased and it has benefitted a lot by allowing people to communicate from wherever they are. But, the drawback of the mobile devices and other electronic devices are that they need to electrically charged and constant use of internet or calls drains the battery in a short time. Without the energy, the smart and advanced phones are lifeless and if you don’t find a power outlet in certain locations, then it can be only used as a paperweight. A power bank comes handy when your mobile battery is discharged and you are unable to find any power outlet. Recently, the number of power bank models has increased and people are confused which model to choose. There are several points to be considered while choosing a power bank like batter capacity of your device, charging voltage, and voltage protection features. While choosing a power bank you should ensure that the charging capacity of the power bank is higher than the battery capacity of your device. For example, if your device battery capacity is 2000 mAh then you should choose a power bank which is more than 2500 mAh. If you choose a power bank with 5000 mAh it will charge your better twice the speed of a power bank with the capacity of 2500 mAh. There can be a slight cost difference between the 2500 mAh power bank and 5000 mAh power bank. You should also ensure that the cable with the power bank is compatible with the mobile device you are using. In case the cable is not compatible then you can also use a converter to charge your device. The converter may have to be purchased separately as most units do not offer a plug converter. Older mobiles use not more than 1 ampere, but the latest gadgets need at least 2.1 ampere to charge the device. To avoid over heating or overcharging of your mobiles, look for the power banks which offer over voltage protection, over charging protection or over temperature protection. The OVP, OCP and OTP features in the power bank starts discharging extra power, once the power bank is fully charged. 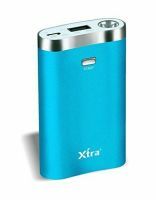 Choosing a power bank is easy, but finding good quality power bank in a reasonable price range is important. While choosing the power bank ensure the type of battery cells that are used in the power bank. The lithium – ion is comparatively the cheapest and easily available, whereas the lithium – poly cells are expensive, but it charges twice the speed of the Li-ion. You can find all sorts of power bank on dealscorner from various stores and brands. You can choose a specific product and compare the prices of the same on different stores. Once you have compared, choose the option with the reasonable price range and enjoy your shopping on DealsCorner.